The event — in support of a California Assembly bill that seeks to increase funding for childcare, after-school service, job placement programs and other antipoverty initiatives — was part block party and part progressive pep rally, as lawmakers took potshots at President Trump and danced to pop songs as they took the stage. 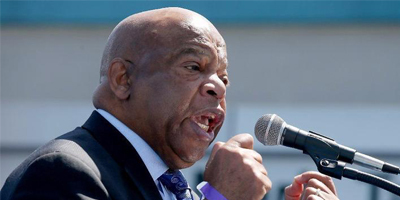 Lewis (D-Ga.) spoke of his days fighting for voting rights and equality in the segregation-era South, encouraging the nearly 200 people in attendance to raise their voices and urge legislators in Sacramento to push the bill to Gov. Jerry Brown’s desk. “Here in California, you must get in trouble, good trouble, necessary trouble, and pass this bill,” said Lewis, whose wife grew up in Los Angeles.